The Course and manual were very informative.Kurt was a great instructor.I would have benefited from more "on Hands".Practice with mixing drinks.Overall very satified with course and instructor. This class was a lot of fun.I really enjoyed taking it.Kurt's good teacher&tells a lot of funny stories.I would definetly recommend this class. Yes, for now only one casino is coming to Toledo – but even in Las Vegas, business is down. 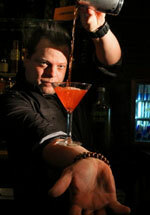 BUT in Toledo and surrounding areas approx sixty-five mile radius… restaurants and bars need more than 6,000 bartenders!